Spirited and graceful, this delightful arrangement of spring buds is an exquisite complement for a sun-filled living room. 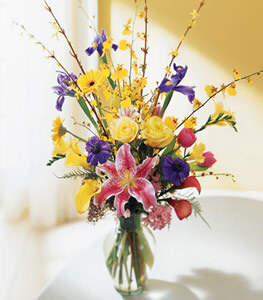 Stargazer lilies, yellow roses, and delicate oncidium orchids mingle with pink tulips (or roses, depending on the season), purple iris, bright yellow forsythia, and more. A most colorful display!